Γύρω στο 1918 πρόβα Σερραίων στα ταγκό της εποχής. Γύρω στο 1918 πρόβα Σερραίων στα ταγκό της εποχής. Τοποθεσία «Κιόσκια» ή κατ’ άλλους, Μπέη Μπαξέ. Προσφορά Φοίβου Τουντζή.Το υλικό αυτό ανήκει στη Δημόσια Κεντρική Βιβλιοθήκη Σερρών το οποίο αποτελεί μέρος της συλλογής του «Μουσικού αρχείου του Γ. Αγγειοπλάστη» το οποίο φυλάσσεται και εκτίθεται σε διαμορφωμένο χώρο στο κτίριο της βιβλιοθήκης. Γύρω στο 1918 πρόβα Σερραίων στα ταγκό της εποχής. Τοποθεσία «Κιόσκια» ή κατ’ άλλους, Μπέη Μπαξέ. Προσφορά Φοίβου Τουντζή. Around 1918 Serres rehearsal in tango era. 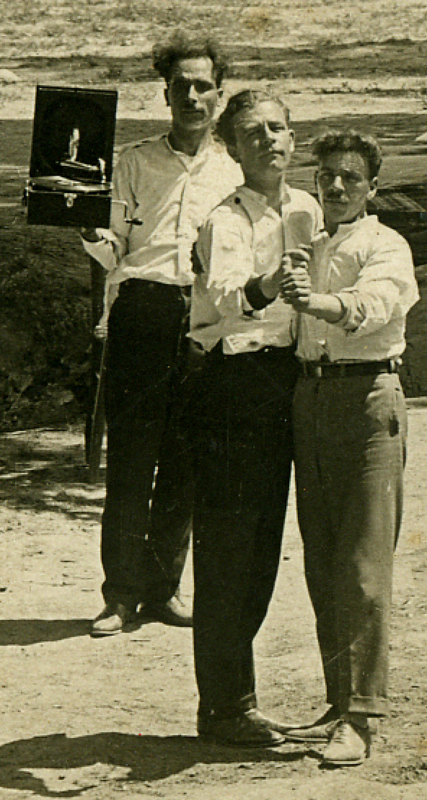 Around 1918 Serres rehearsal in tango era. Location &quot;pavilions&quot; or according to others, Bey Baxe. Offer Phoebus Tountzi.To material belongs in Public Central Library of Serres, which is part of the collection of &quot;Music of the C file. Potter&quot; which is stored and exposed to a designated area in the library building. Around 1918 Serres rehearsal in tango era. Location &quot;pavilions&quot; or according to others, Bey Baxe. Offer Phoebus Tountzi. At about 1918, rehearsal of people from Serres (city to the north of Greece) dancing the tango of their time period. Location “Kioskia”, known by others as Mpei Mpakse. Donation of Phoibos Tountzis. This material belongs to the Municipal Central Library of Serres, being part of the collection of the “Musical Archive of G. Aggioplastis” which is guarded and exhibited in a specifically designed area within the building of the library. To which I would add: The men are all posing as if they have been instructed how to stand, or sit. Apart from the two couples in distinctive tango holds, two of the seated men hold musical instruments – a mandolin and a guitar – while two other men tend gramophones, a wooden cased, table model on the circular wrought iron table, and the figure standing behind the left-hand tango couple is holding a distinctive Decca Junior portable gramophone on one hand, a testament to its relative lightness, and tanatlisingly, it looks as if the tone arm, soundbox and needle are resting on the record as if it is actually playing. Decca gramophones of this kind had been popular with British soldiers throughout the First World War, but this model, the Decca Junior, identifiable because of its proportions, its single, centrally placed clasp to hold the lid shut, rather than the two of larger, earlier machines, and the winding handle conveniently sticking out to the right, rather than at the front as found on some other Decca models. 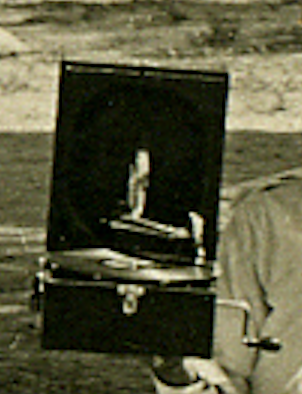 According to at least one authority on gramophones, Ian Caldebank, the Junior was first introduced in 1923. http://www.gramophones.info/gramophones.decca.junior.html (accessed 10 January 2107). For this reason, I am obliged to doubt the apparent certainty of 1918 as the date this photograph was taken. Even if they ARE posing, the fact of the men being in tango holds implies they had been, or intended to dance and wanted that fact recorded by the photograph. They are relaxing. At least one of them must have arrived more formally dressed in a jacket and straw boater hat, hanging from the tree on the left. Otherwise, all bar one of them have taken off their detachable collars and ties, some have rolled up their sleeves. They are having a picnic. 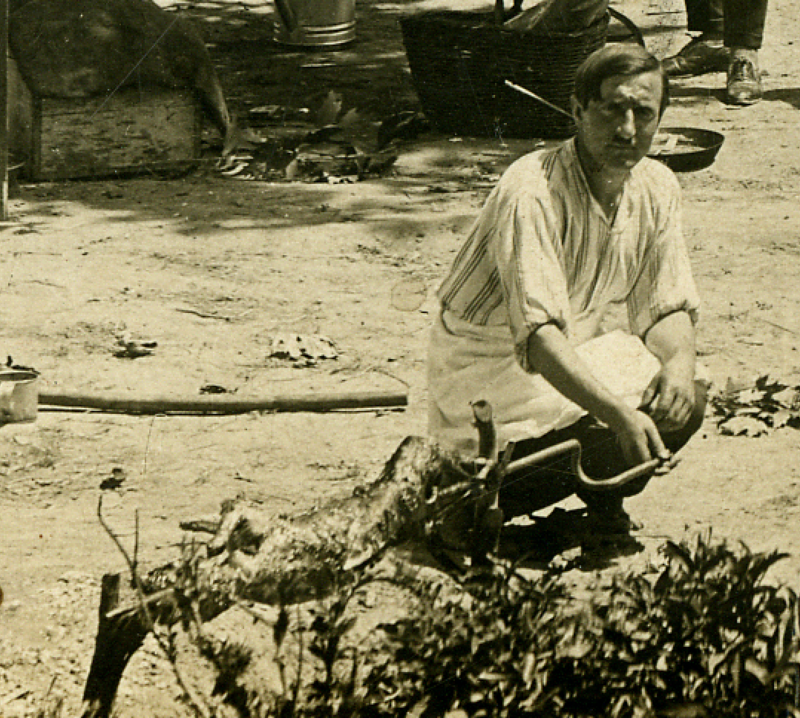 The figure in the foreground wearing a short apron is roasting a goat or sucking pig on a spit while the seated figure closest to the camera is stirring a large, lightweight looking, metal pot, lid to one side, on a trivet presumably over burning wood or charcoal. It is a well-furnished picnic, with tables and chairs carried to the site from a car or from a building – the one under the tiled roof, top right, perhaps? 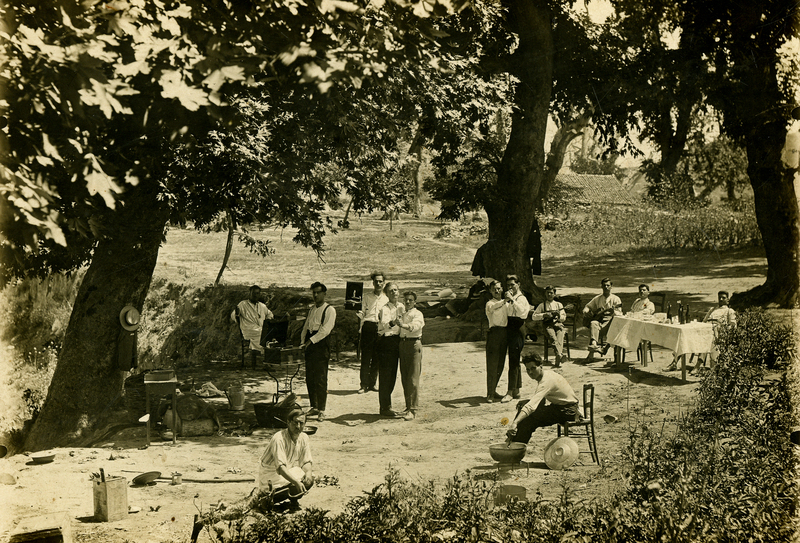 The location would appear to be countryside rather than a more formal park landscape in the city of Serres itself and from the small shadows cast, it would appear to be about midday and hot. The figure smoking at the back smoking a cigarette in the shade seems to be wearing a shirt under loose outer garment – a nightshirt? The men are behaving as if they have the space to themselves. One Response to "Men, some in tango poses, Serres, Macedonia, 1918; or after 1923…"